Jamon Brown (left) and Greg Robinson are working on technique during the bye week. 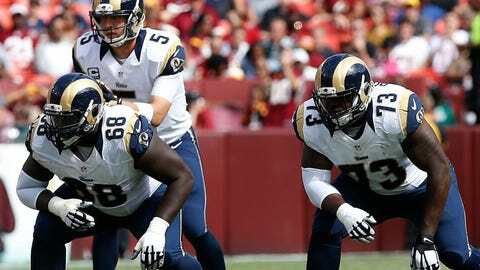 ST. LOUIS — The St. Louis Rams lost plenty of experience on the offensive line when guard Rodger Saffold injured his shoulder in the first half of Sunday’s loss in Green Bay. They’re using the bye week to help figure out what to do. Left tackle Greg Robinson, in his second year and now a veteran in this group, said part of Tuesday’s workout was devoted to dealing with stunts and twists that teams have been throwing at the Rams (2-3). Coaches are stressing that proper technique can foil such tactics. "We worked on it a lot today, just because it was so obvious that teams have noticed we’ve struggled with it and if we don’t fix it it’s going to continue to happen," Robinson said. "Once you stop them, they’ll stop gaming us." Linemen worked on making sure they popped back off the line at the snap to give themselves room to deal with the rushes that are coming from everywhere. "If we keep everything in front of us, they’ll basically be twisting on air," Robinson said. "If we give them our bodies and we don’t get back it’s easier for them to knock us off-balance." The line is a collection of diligent workers absorbing the finer points of the game from line coach Paul Boudreau. "If we don’t exaggerate the techniques in practice, we won’t really fix the games," Robinson said. "Nine times out of 10 they will give it away, guys will talk or there will be things you notice." Saffold, a six-year veteran, will be out indefinitely with a right shoulder injury. He also had problems with the shoulder during the preseason. And he has had issues with his left shoulder, and underwent surgery after last season. On Tuesday, coach Jeff Fisher had no update on the prognosis for Saffold, who had been undergoing testing. "He was one of the vets in the room and we need that leadership on the field," Robinson said. "I just hope that things go well and he can stick it out." The Rams signed swingman Garrett Reynolds to a free agent deal in the offseason for just such a situation. He has 27 starts, including four last season at tackle with Detroit and 10 at guard in 2013 with Atlanta. "Nothing was ever said to me, but that’s just the kind of person I’ve always been," Reynolds said. "Wherever you need me, throw me in there and I’ll be ready to roll." The Rams made it tougher on the opposition when they separated rookies Rob Havenstein and Jamon Brown, who played side by side much of the preseason. Havenstein stayed at right tackle and Brown moved to left guard. "Breaking us up made it harder to pinpoint, but we’ve still had our share of twists and stunts," said Brown, a third-round pick. "I think teams are going to keep doing it because it’s the hardest thing to pick up." Even after losing Saffold, the line showed its strength in the run game by opening holes for rookie Todd Gurley. Gurley had 146 yards at Arizona in his first start and topped that with 159 yards last week. He ranks second among rookies with 314 yards to go with a 5.7-yard average. "Gurley has had two big games," Robinson said. "He’s a great player, he’s been running hard — and we’ve been blocking hard."